You will find on these pages the celebrity horoscopes having Apollon in the 12 signs with an interactive chart and excerpts of astrological portrait. Apollon is related to the ability to synthesise, as well as to broad-mindedness, and fame. In difficult aspect, it may bring about superficiality or extravagance. Hypothetical trans-Neptunian planets - Cupido, Hades, Zeus, Kronos, Apollon, Admetos, Vulcanus, Poseidon, and Proseprina - the existence of which is not proven, were invented by Alfred Witte, founder of the famous Hamburg School, and by his student, Friedrich Sieggrün. The position of the celestial bodies, as seen from the Earth and the place of birth, is established in connection with a system of coordinates based on the horizon and the zenith. 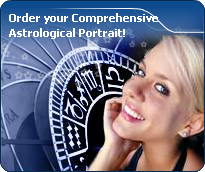 For each astrological chart, the time and place of birth are processed in order to get markers that are specific to the individual. This is how it becomes possible to materialize the positions of the planets, the Sun, and the Moon in the window of heaven known as the Zodiac. The celestial belt where the Sun relentlessly follows his course, when seen from the Earth, is divided into twelve equal parts called zodiacal signs. It all works out as if all the human features were represented within the whole twelve signs. Each sign reflects an independent and strong typology, complementary to the other signs, expressing by itself its nature and its personality with its characteristics, its tendencies and its motivations.